One of my favorite events of the year returns in just couple of weeks. During Viva Calle SJ, miles of city streets will be completely shut down to let people walk, run, bike, or skateboard down the streets of San Jose. Viva Calle features multiple activity hubs which are basically festivals-within-a-festival that highlight the local area. This year they will be located in Japantown, Roosevelt Park, the Mexican Heritage Plaza, Alum Rock Village, and Lake Cunningham Park. You can expect live music, vendors, food, activities, bike parking, and good times at each and every one. In between the activity hubs you will still find all sorts of interesting stops, hydration stations, and stores. The route has changed again this year. 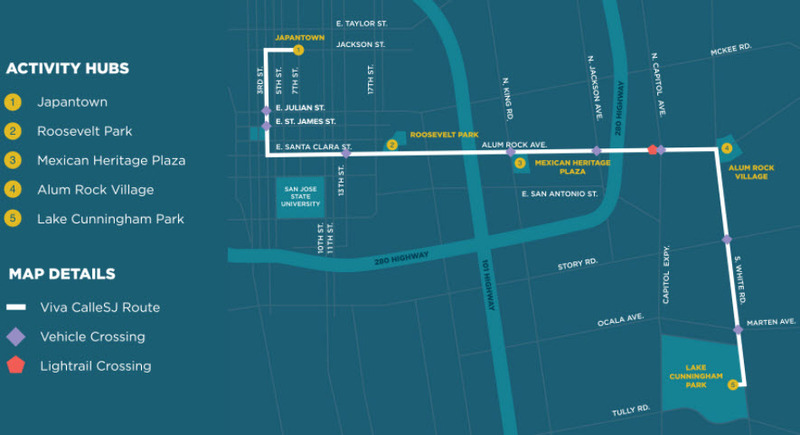 It is now just a single line without branching out, and for the first time it will go straight down Santa Clara Street. At 7 miles and five activity hubs, it is the largest Viva Calle yet! If you are one of the 50 million people that still play PokemonGo, the company that makes the game is leveraging Viva Calle as their first official event in San Jose. I'm about to out myself as a huge nerd, but I use the game when visiting someplace new to find hidden street art and all sorts of points-of-interest that even locals don't know about. It's like a hyper-local Tripadvisor for each block. The game will feature temporary stops and extra pokemon along the route as part of the event. Viva Calle 2017 takes place on Sunday, September 17th from 10am to 3pm (streets are closed until 4pm). It is completely free and has no designated beginning or end as it's not a race. You can use the handy map below to locate the routes and festivities. For more info, head over here. Hope to see you there!